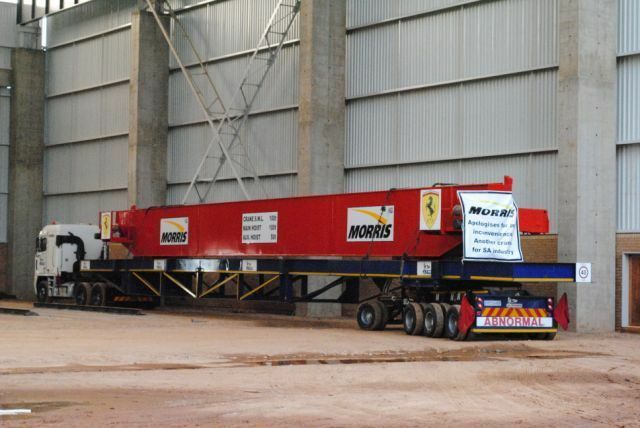 Morris Cranes, a Division of Morris Material Handling SA (Pty) Ltd, a wholly owned South African company and the agent of ABUS Kransysteme GmbH in South Africa, has supplied a total of eighteen Double-Girder cranes to Efficient Engineering Pty Ltd.
Certified to ISO 9001:2008 standards, Efficient Engineering is a world class steel fabrication, machining, manufacturing and heavy engineering works located in Johannesburg, South Africa, with more than 230 employees. Efficient Engineering has over 40 years of experience in this industry, and is capable of meeting local and international engineering expectations, regardless of the project. From humble beginnings renting a 3 square meter bench in Ophirton, Johannesburg in 1968, Giuseppe Cimato established Efficient Engineering as a company specialising in the manufacture of cabs and operator cabins for forklifts and trucks. In 1983, Cimato’s son Tony joined the family business and finally took over the reins of the up-and-coming manufacturing business in 2000. By 2006, the Sebenza operation eventually grew into a 4,000 m2 facility. October 2006 saw the development of Phase I of Efficient Engineering’s newly established 6,300 m2 headquarters in Elandsfontein. Increasing demand necessitated the construction of the company’s 4,200 m2 Phase II Elandsfontein development at the end of 2008. By March 2009, the company established its 2,000 m2 Phase III development. 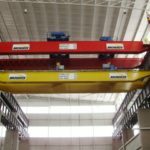 Various Morris / ABUS Double-Girder EOT Cranes were supplied on this project ranging from 20ton to 100ton. Efficient Engineering is currently completing the construction of Phase IV and V of its expansion which—when in operation—will involve the company profiling its own steel. Efficient Engineering currently boasts a total manufacturing area of 21,800 m2. The cranes were manufactured by Morris on the basis of ABUS Components. 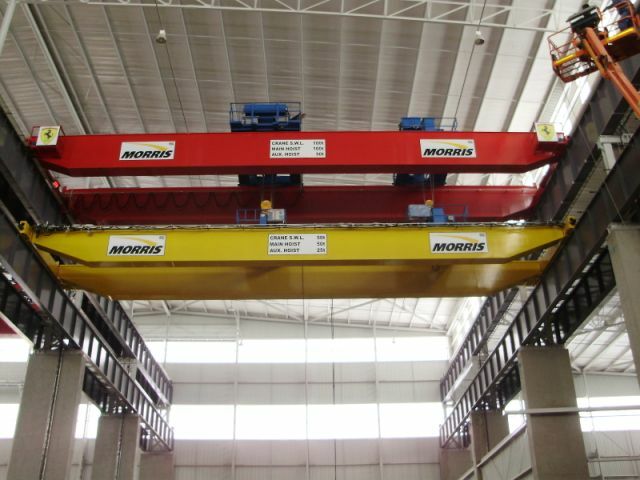 Each of the two centerpiece cranes is equipped with two hoists: the main hoist of 100t of the double rail type as twin hoist version plus the 50 tons auxiliary hoist. 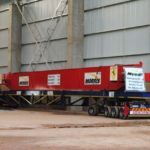 All cranes and hoists were supplied with full length platforms on girders and platforms on the trolleys. These 2 cranes were painted in Ferrari red as the owner is an avid Ferrari fan. 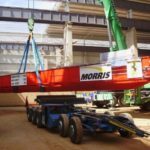 The Morris / ABUS cranes are in use from the incoming goods department as well as in the production processes where machining and profiling machines are fed with the relevant materials used in the construction of the equipment supplied. 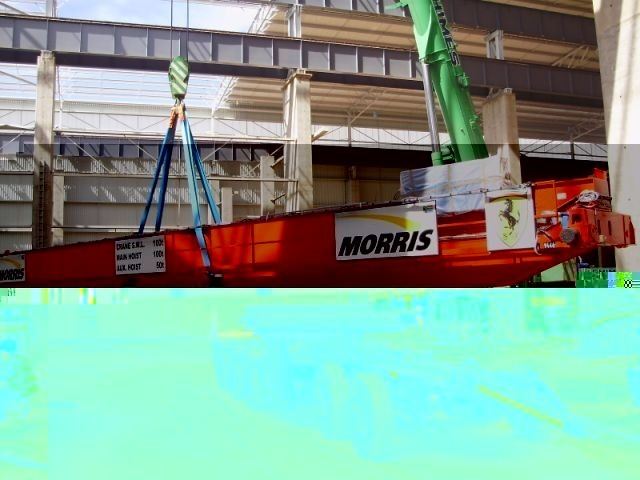 Efficient Engineering now has a total of 27 Morris / ABUS EOT cranes on site.